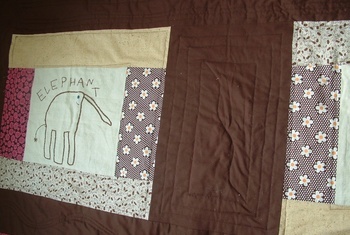 This summer in flurry of embroidering Calvin's art, I made these squares. 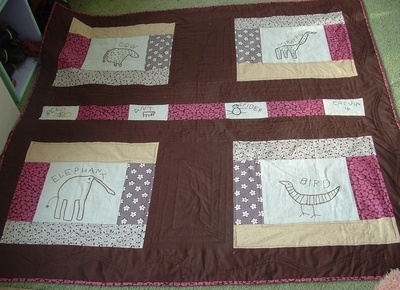 They sat untouched until a few weeks ago when I got some inspiration and umpfh to turn them into a quilt. 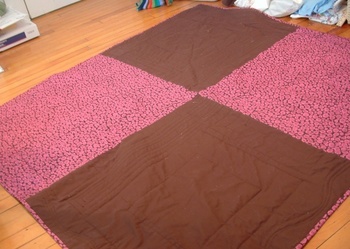 It was a little funky working backwards-- trying to "design" the quilt after I had the squares made--but I think it worked out okay. 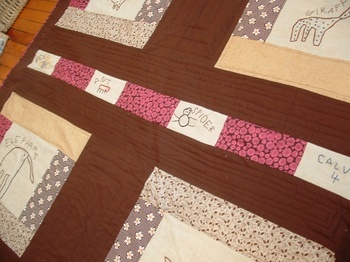 The brown is overwhelming in the photos, but the quilting on it make it less boring in person, I think. Anyway, here it is completed. 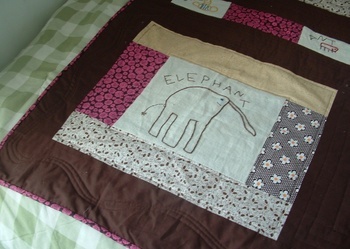 (and can I just say how hard it is to photograph a quilt? Wow!). I really loved working on this, and hope I have the energy to do the same with Ezra and Adelaide's art when the time is right. Trying to replicate his handwriting was loads of fun, and embroidering his art is such a great way for me to get "in" his brain. I was surprised at how much I enjoyed the (machine) quilting part of the process (though it did make me long for a new machine! 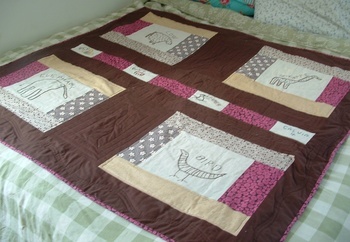 ), and *miraculously* there's no "puckering" that I experienced in my first two quilt attempts. The most challenging for me was the binding--not the making of it--but the blindstitching it on at the end took several hours, at which point I was very impatient to have it done (I used DSQ as a reference for binding). Oh, and the best thing is that Calvin approves of the final result of his art.